No digital product is ever perfect or finished. Even a site that is 90% cheaper than its predecessor, and boasts a user satisfaction reaching post-launch heights of 80%. My challenge as the new product manager for the Department of Health’s intranet is to build on that daunting baseline, and carry on the great work of my predecessor, Kylie Mulholland. 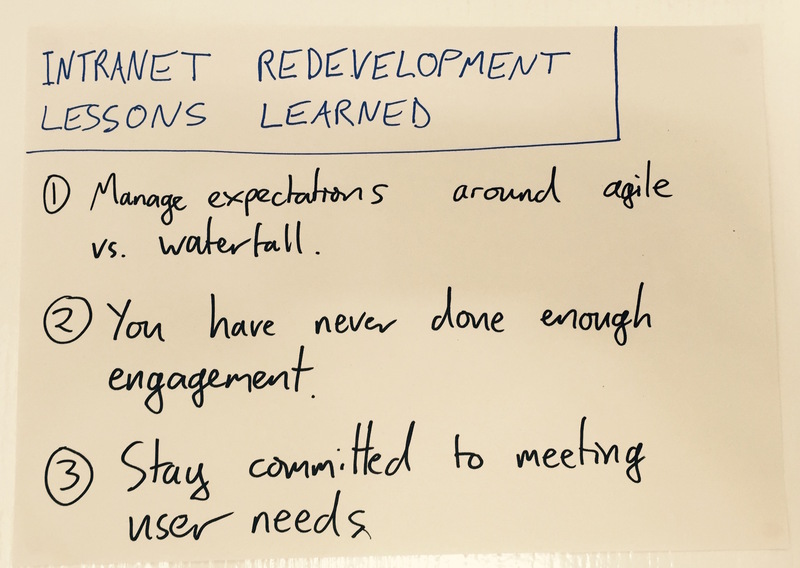 Revisiting the lessons learned from the intranet’s first development seemed a good place to start. Over the summer we ran a discovery phase to understand how people were responding to the new site. We found that overall, users much preferred the new product to what came before. However, they would still like to find things more easily through either search or navigation, particularly the things that help them do their job. These findings were borne out by analytics data: video conferencing arrangements consistently appear among the site’s top search queries. The discovery also revealed unmet needs on the editorial side, where content owners and editors wanted a more streamlined publication process. Last week we brought together a multidisciplinary agile team to begin a new period of development. We work in several organisations and multiple locations; Whitehall, Old Street, and as far as Atlanta, Georgia, so online tools like Slack, Basecamp, and Talky are helping to keep us connected with each other and our users. Our first step was to draft a set of high level goals for this phase of development, which support our overall vision of making the DH intranet the best in government. As ever, we welcome feedback. Borrowing a method from the Government Digital Service, we then built a prototype roadmap. This exercise forced us to think about what we would have to learn or prove if we wanted to achieve our goals. For instance, to show that “users can find everything they need”, we need to first find out what users are looking for, and then show, using data, that our improvements actually do help users find those things more easily. We also identified and prioritised the big themes emerging from the discovery and mapped them against a rough timeline of development sprints. These included search and navigation, events, content management, and sign-in. Finally, we used the roadmap to map out: our users, the wider ‘system of systems’ that support the intranet, our most important stakeholders, our assumptions, and any dependencies. This helped surface challenging questions early on. Our prototype roadmap is on display in Richmond House and will help us communicate to stakeholders what we are doing, why, and broadly when. Before we get going on new features, the team are first reviewing and cleaning the code base, fixing bugs along the way, and by the end of the week we'll have it back in GitHub. Making things open makes them better and from next week any organisation can take our code and ideas and start to build their own intranet sites, according to their own users’ needs. I've learned a lot in my first weeks in product management. It has not taken long to experience the tension between user needs (what evidence suggests end users of the product want to see) and business needs (what other stakeholders would like their users to see). This forces you to ask some pretty fundamental and philosophical questions about the real purpose of the 'thing'. I’ve also learnt that getting the right policy, process, and governance around the product may be at least as important as the product itself. Finally, I've sensed that many digital folk think that intranets are the devil’s work! It's our job to prove them wrong. I like what I have read so far...it also helps to have a sense of humour. Vital when having anything to do with the digital age....keep going!